The information provided by Social Enterprise Business Centre (SEBC) in this website and the Social Enterprise Directory (“Directory”) is for reference only. SEBC endeavors to ensure that the information in the website and Directory is correct and accurate but after all, some of the information is provided by third parties, SEBC cannot make any express or implied warranties with respect to the accuracy or completeness of such information contained in the website and the Directory. In the premise, SEBC will NOT be liable for any errors in, omissions from, or misstatements or misrepresentations concerning, (whether expressed or implied), any such information delivered on this website or in the Directory. This website may contain information contributed by third parties and may contain hyperlinks to other resources maintained by third parties on the Internet. 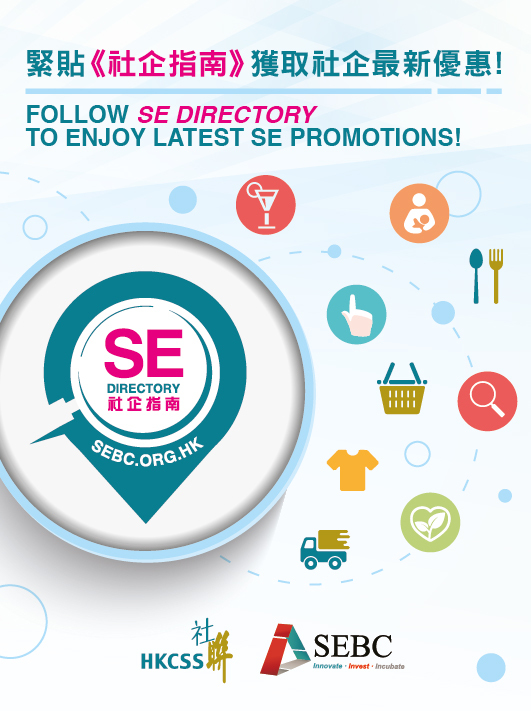 SEBC expressly states that any hyperlink connection from this website does not grant any direct or indirect and implicit or explicit permission to the visitors for connecting this website to those other websites, or for reproducing materials from the content in this website or in those other websites. If you have any query, please contact SEBC or the owner of the external website or seek for professional advice. SEBC is not responsible for any loss or damage whatsoever arising out of or in connection with any information on the website or in the Directory. SEBC is entitled to delete, suspend or edit all information on this website or the Directory at any time in its sole discretion without giving any reason or prior notice. Users are responsible for making their own assessment of all information contained on or in connection with this website or the Directory and are advised to verify such information by making reference to its original publication and obtaining independent advice before acting upon it. By accessing this website, you unconditionally agree to the terms of this Disclaimer and as they may be modified and/or supplemented from time to time by SEBC without prior notice to you. Please check this website regularly for any modifications and/or supplements which may be made.